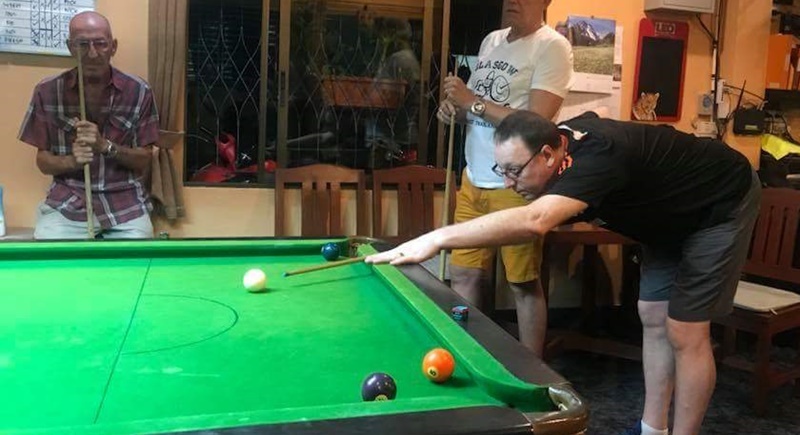 POOL: It was a wet playing conditions in the 7th round of the Patong Pool League (PPL), sponsored by Thailand Pool Tables, last Thursday (Feb 1). Paul Montgomery, owner of and player for Ting Tong Bar on Nanai Rd. Wet playing condition, pool, you may be asking yourselves as we all know pool in usually an indoor sport. Well there’s an exception to the rule in the PPL, and that is that Wombat Bar plays their matches in the open air. With torrential downpours hitting the island last Thursday night, the game between Wombat Bar and Simon & Oils was interrupted several times. Some players even decided to continue playing in their rain coats and were forced to pot “floating balls”. However, after a long, drawn out game Wombat finally overcame Simon & Oil to seal a good 7-4 win. Meanwhile, the top two teams of last year’s edition of the league, Natalie Bar and Wet Dreams met each other again. As has been the case pretty much in all their games this season, Natalie Bar got off to a blazing and had taken a good 5-1 lead after the singles. Wet Dreams did managed to claw back a point in the remaining games with the final scoring being 8-3 in Natalie Bar’s favour. Elsewhere, Martin Swiss hosted Ting Tong Bar in their 7th round game with the visitors walking away with a big 2-9 win meaning they are still in serious contention, along with Natalie Bar, to take this year’s PPL title. Happy End took on Caddy Shack in last Thursday’s action and it was a close game to begin with with the score being at 3-3 after the singles matches. However, Happy End, who were missing “teacher Tak” as he was on a short break in Japan, still had their exceptional Thai players Peter and Fern and they played very well to give the hosts a comfortable 7-4 win. Finally, Red Light Bar were at home to Hole in One with the later leading 1-5 after the singles matches. However, Red Light didn’t give up and managed to get the final score back to 4-7. Red Light bar’s Belgian player Andy was involved in all the home teams winning points takig victories in each of his games. The next round of the PPL will take place on Thursday (Feb ) with an interesting battle scheduled in Kathu between Hole in One and Natalie bars.